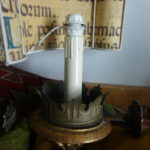 Rarely can you find such unique, one of a kind, antique lighting fixtures. 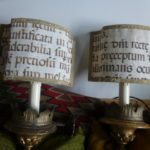 This couple of scones (appliques in Italian ) were commissioned to Rome’s famous lampshade (paralumi ) maker, Tullio Senzacqua in his laboratorio artigiano on via dei Pianellari, near Piazza Navona, back in the 1960s. 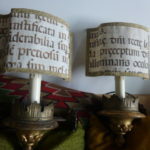 The shades are fashioned from handmade and inscribed parchment dating from the 1400s. 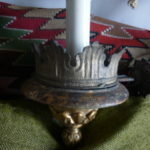 The base is a combination of sculpted and gilded wood topped by a hand wrought metal “crown”. The electric wiring has been updated and ready for modern led bulbs. 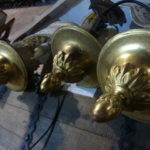 They are ready to be hung up on a wall using the original metal brackets. Measurments: height 50 cm. 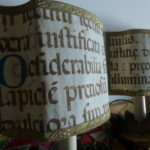 Width of lampshade 37 cm. Perfect condition. Contact me for price, shipping information. 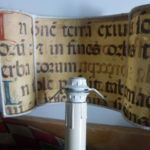 Can also be found on my ebay page.